Invisible-5 is a self-guided critical audio tour along Interstate 5 between San Francisco and Los Angeles. It uses the format of a museum audio tour to guide the listener along the highway. Invisible-5 investigates the stories of people and communities fighting for environmental justice along the I-5 corridor, through oral histories, field recordings, found sound, recorded music, and archival audio documents. The project also traces natural, social, and economic histories along the route. It was produced in 2006. Download the full audio tour or listen to individual stops in the right hand column. 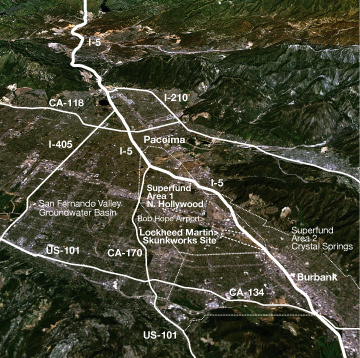 LANDSAT Image of the San Fernando Valley, facing north towards Pacoima, showing the perimeter of the North Hollywood (Area 1) groundwater contamination Superfund zone. North Hollywood is one of four areas of groundwater contamination within the San Fernando Valley Basin, and consists of two parts, the North Hollywood Operable Unit (OU) and the Burbank OU.